How people go travelling for 3 months, 6 months or even a year and manage to find the strength to board that flight back home I have no idea. I was in Bali for just 1 month and yet getting out of the taxi at the airport seemed to require more motivation than hauling myself out of bed for my 6:00am yoga classes. However, as the one-week anniversary of my departure from that beautiful country approaches, I have decided to switch my negative mindset of the reality that I am not there anymore, to focusing on the incredible 4 weeks I was fortunate enough to experience. 2 flights, 2 films and 1 entire TV series later, I landed in Ngurah Rai International Airport. 45 minutes after everybody else had left the baggage reclaim area my suitcase crawled out onto the empty conveyor belt. After 19 hours of flying, the relief of knowing that I had made it to the other side of the world with everything that I intended to bring with me was, unsurprisingly, a relief. Making my way to the airport exit I eventually found the driver that would be taking me to my final destination, and there I met the first 3 of an amazing group of volunteers that I was going to have the pleasure of spending my 4 weeks with. 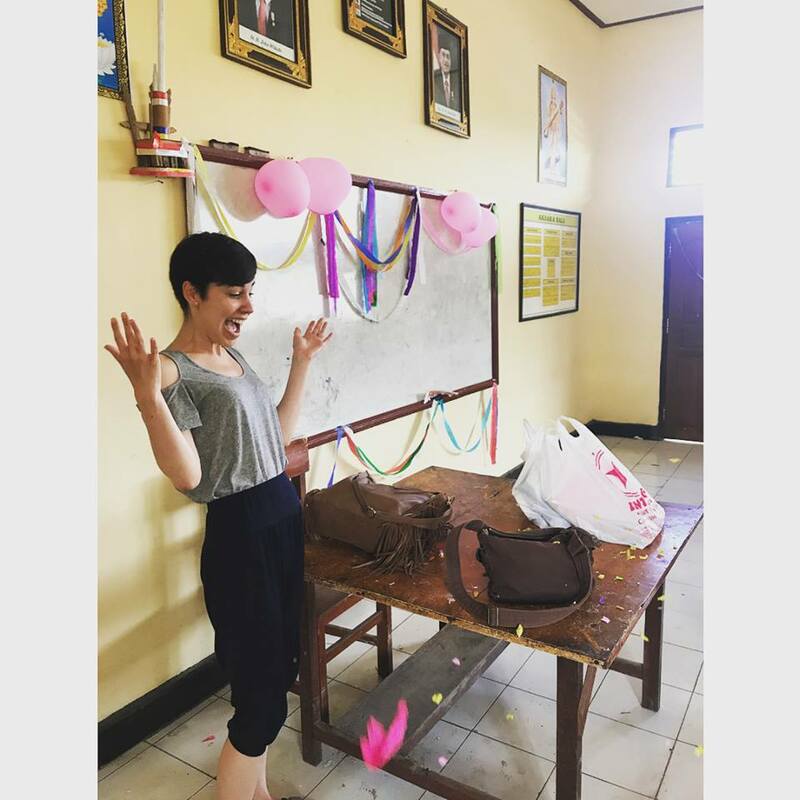 It was from that moment that I realised that not only was I going to be learning about Balinese culture, but I was also going to have the opportunity to learn about cultures from all over the world! An hour and a half drive led us to Penestanan Kaja, near Ubud, where I would be living for the next month. As I dragged my suitcase up the stairs to our volunteer house, I met some of the most special ladies that literally made my entire time in Bali the best that it could have been. From all over the world- Spain, Denmark, Ireland and, well, Barnsley; yet we all had something in common, the desire to travel and volunteer. Every day I would discover something new about their lives and every evening I would go to bed feeling inspired by their stories. As the weeks went on I met so many more incredible people from the USA, Scotland and Germany, similarly leaving the same impact on me following every conversation. It is those moments that reaffirm exactly why I travel- to meet likeminded and inspiring people I would never be lucky enough to meet in any other situation. Anyway, let me move on before I start getting emotional! 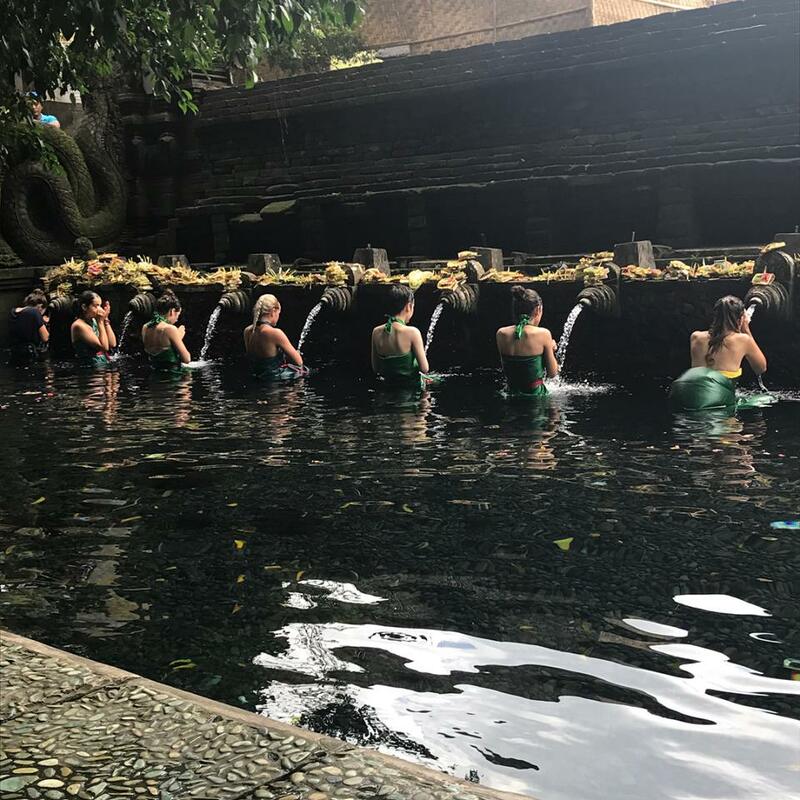 So week 1 was aptly named a cultural induction week, with activities such as visiting the Sacred Monkey Forest, watching a Balinese dance and fire show, learning how to cook a traditional Balinese meal, producing a batik painting and visiting the Pura Tirta Empul Temple. The activities were great to learn more about the culture, but nothing compared to the experience of living amongst the community in Penestanan Kaja. Every time I walked through the village, the locals would say hello with a big smile on their face. Toddlers, teenagers, or elderly people, I never came across a single person that did not make me feel welcome in their village. It was fascinating to watch their daily rituals of leaving flower offerings to the Hindu Gods all around the house. 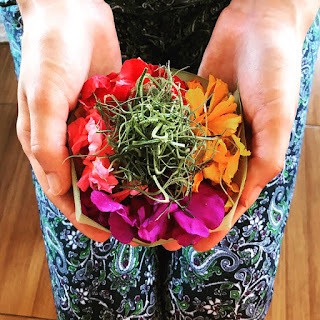 One of our activities was to make a flower offering and having spent 30 minutes making one, I was shocked when I later found out that the women make 100 of them every single day! Week 2- volunteering! 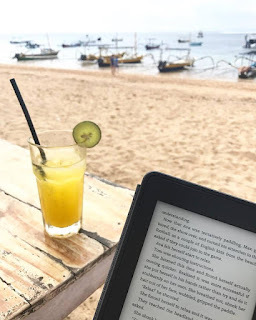 Having spent the first week learning about the lifestyles of Balinese people, I was very keen to know more about the current state of the population’s health. As a healthcare promotion volunteer we were very fortunate to have the opportunity to speak to a local GP who gave a very detailed presentation about common issues within Balinese communities. Having used public toilets in both urban and rural areas around Ubud, I did not need to be told that personal hygiene was a significant issue. Also, having eaten a Balinese diet for a week already (more on this later! ), it did not come as a surprise that deficiency diseases and malnutrition were a concern. Of course, it was fantastic to be armed with this knowledge, but trying to utilise it in order to educate a group of 10 year olds with a basic understanding of English was going to be a whole other challenge. With my volunteer partners we started to plan the topics we wanted to focus on and different activities we could do in order to try and engage the children as much as possible. 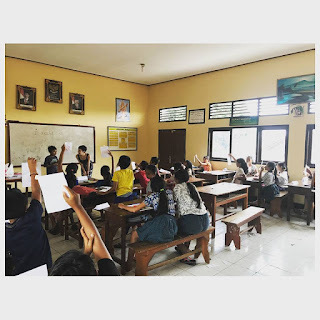 We decided to use the first day as an introduction lesson and to gauge an understanding of children’s English skills, from which we established that we needed to keep things as basic as possible. We taught topics such as physical activities, fruits and vegetables and hand washing, through the use of picture games, bingo and worksheets. It was fantastic to watch the children engage with the work but also to develop their skills so much within the space of just 4 days. It was overwhelming to see their gratitude for volunteer participation, but also for things that we may just take for granted here in England. On my final day, one of my fellow volunteer partners and I decided to buy the children plastic folders so that they could keep their worksheets safe. I can honestly say that it was the most worthwhile 47,000 rupiah (£2.73) that I spent during my time in Bali. The delight on their faces was an absolute joy to watch- even more so when we awarded smiley face stickers for a game of bingo, which they all used to decorate their folders! Even though I only spent 5 days at the school, it was an incredibly enriching experience. I will treasure those incredible memories for the rest of my life, from the yoga session lead by a lovely young girl, to the leaving party the children surprised me with on my last day! For my second weekend in Bali, I decided to go away to the beaches in Sanur. Although the weather was not great, it was exactly what I needed- an opportunity to explore, relax and reflect. I walked along the extensive beachfront path admiring the beautiful sea views and café-hopping, enjoying delicious Indonesian dishes. Naturally, as I was alone that weekend, I had a lot of time to think. It was not by coincidence that I decided to fly out to Bali on the 16th July, it was because that was the 2 year anniversary of my hospital admission, and as I sat sipping a glass of orange juice reading my book in Sanur, I was suddenly aware of how different my life is now compared to 2 years ago. At first, the realisation did not quite sink in, but shortly after the memories started flooding back and so did a few tears. I looked up from my book to see the white sand and clear blue sea. What I was viewing right at that moment was what I had been looking at on a computer screen as motivation to recovery whilst sat in my room at the specialist eating disorder unit. Now I was not only looking at it but I could hear it, I could touch it; I had made it. After a weekend of relaxation it was time for my adventure week! Following the development of a new-found confidence from my uncharacteristic antics last year in Europe (e.g. paragliding! ), I was more than ready for some activities that I was only ever going to be able to experience in this amazing location. 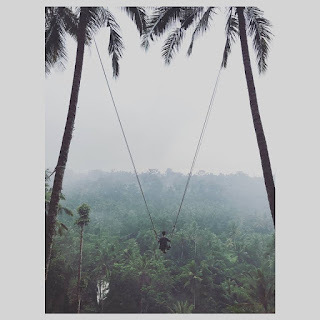 I was not disappointed with the itinerary of a cycling tour around Kintamani, a visit to a turtle sanctuary, whitewater-rafting down the Ayung River and a sunrise hike up Mount Batur. Similarly with everything that I have come to understand about being a solo traveller, the enjoyment of most experiences is heavily reliant on the people you get to share those experiences with. Fortunately, during this adventure week I once again had the pleasure of meeting some very inspiring ladies, who all had the same determination to get the most out of the activities. Particularly with the sunrise volcano hike, that enthusiasm was exactly what I needed. A little lesson was learnt that day- do not try to embark on a 2 hour trek at 4:00am up an active volcano wearing 5 year old Converse trainers in the pitch black with a dim torch when you have not had any sleep. Nonetheless, although the sunrise views were incredibly well masked by a thick layer of clouds, I was just immensely proud of myself for making it to the top of the volcano! 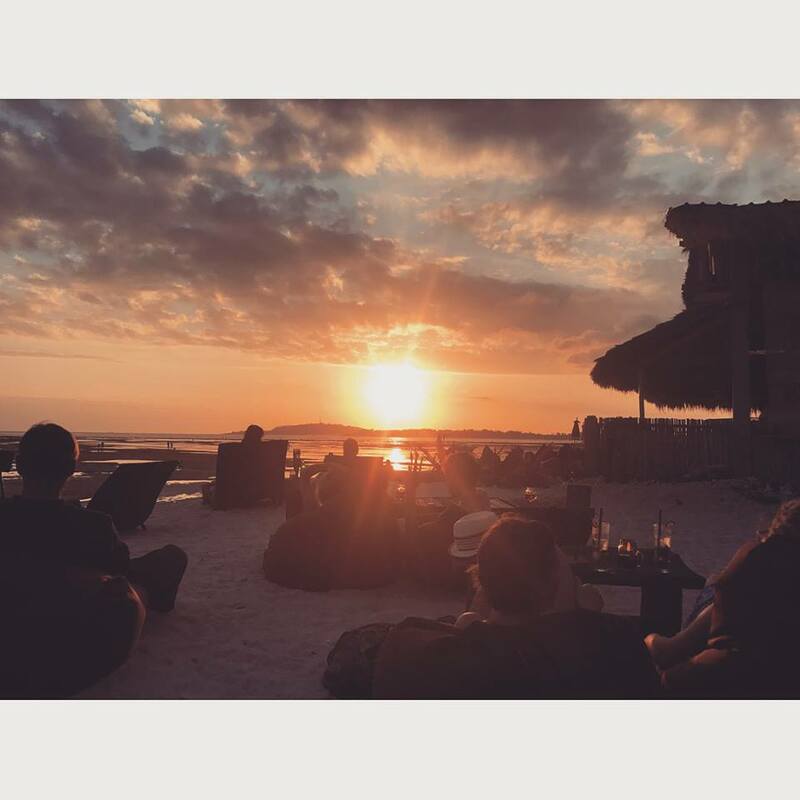 When I booked my trip to Bali, I was adamant that I was not going to leave without visiting one of the Gili Islands. 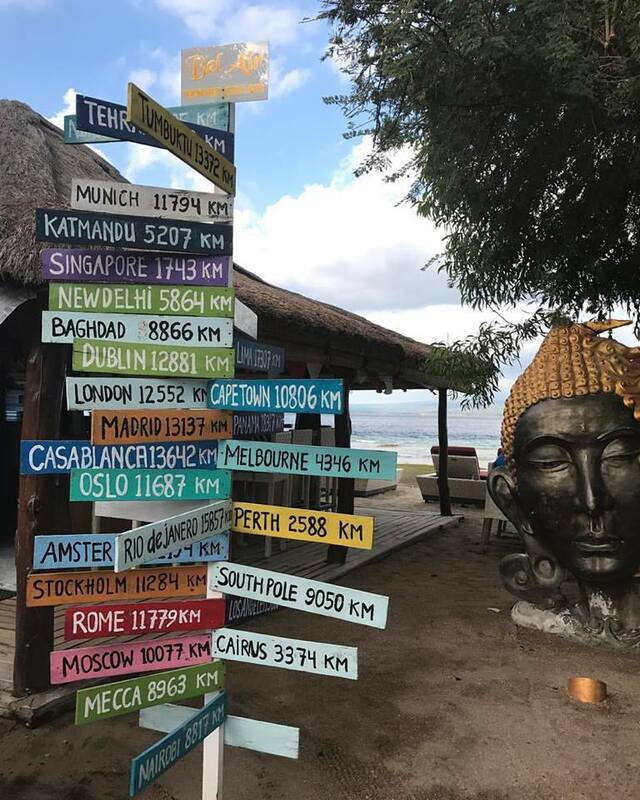 After some investigation into the atmosphere on each of the 3 islands, my friend and I decided that we would head for the relaxing ambience of Gili Air. Little did we know how much we would cherish that relaxing ambience after the tiring ordeal we had to go through to get there! 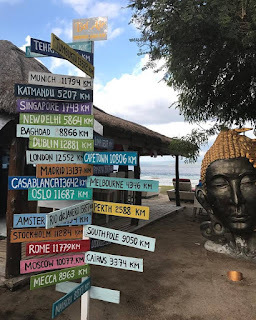 Without going into all of the lengthy details, we set off at 7:00am and arrived at our accommodation on Gili Air at 9:00pm (we should have arrived at 11:30am!) Basically, we had a 2 hour bus drive to the harbour, followed by a 6 hour ferry ride to a harbour on the west coast of Lombok, which meant another 2 hour ‘bus’ (tin can) ride to a different harbour and finally a 25 minute boat ride to our final destination. 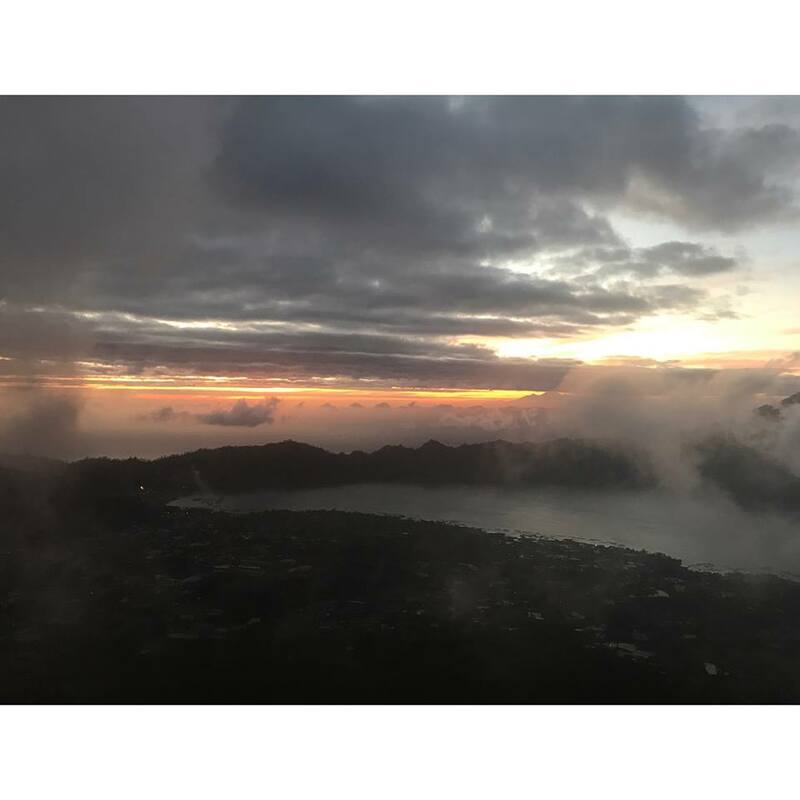 Throughout that time we had about 4 hours of waiting between each transport method, as well as being scammed out of a further 300,000 rupiah by locals in Lombok demanding money for transport services we had already paid for. It was an intimidating, tiring and frustrating experience but waking up the following morning to a beautiful sunrise made it all worthwhile. When I look at photographs of the most idyllic beaches, I sometimes question whether sand can be that white and the water can be that clear, but the beaches in Gili Air were exactly like that! Beautiful views teamed with the peace of having no vehicles allowed on the island, the weekend was every bit as relaxing as we had hoped for. Well, I say that, but as an onlooker, watching one girl that is petrified of the sea and another girl that is petrified of fish trying to snorkel may not have quite been the depiction of tranquility! Nevertheless, sitting on beanbags on the beach, eating a delicious meal and watching the most spectacular sunset was enough to bring us straight back into the relaxed mindset we set out to achieve. With the relentless noise from the 65 roosters residing opposite our house, it was not as difficult as I would have initially anticipated waking up at 5:20am for the first of my yoga classes for my yoga week. As I made my way to the yoga house in the pitch black whilst half asleep, I was already praying for a relaxation session at the end where I could regain those much-needed lost minutes of sleep! As the exercises commenced, I looked out across the rice paddies and watched as the transition from a heavy black sky to a beautiful display of pastel blues and pinks began to take place. With my mind initially preoccupied with frustration and self-criticism about my tiredness, lack of flexibility and inability to do the hardest variations of exercises, it was like watching the darkness of my thoughts fade away to reveal the beauty of a new day. With a free day between the morning and evening yoga class, I decided to spend this time relaxing either by the pool or by reading my book in a local café. This is the beauty of travelling alone- you fill your days with anything you desire! In fact, it was during this final week in Bali that I found some of the most interesting and inspiring people; one man that had literally done the Eat, Pray, Love journey, a couple that had started a charity helping vulnerable women in New Zealand and a group of lovely ladies who I had the most mind-clearing conversations with. Through sharing our stories, you begin to appreciate how no two lives are the same and everybody experiences challenges, but the main focus is how you deal with them. Not only does it show you the realities of life, it also shows you that what may seem impossible is more than achievable. 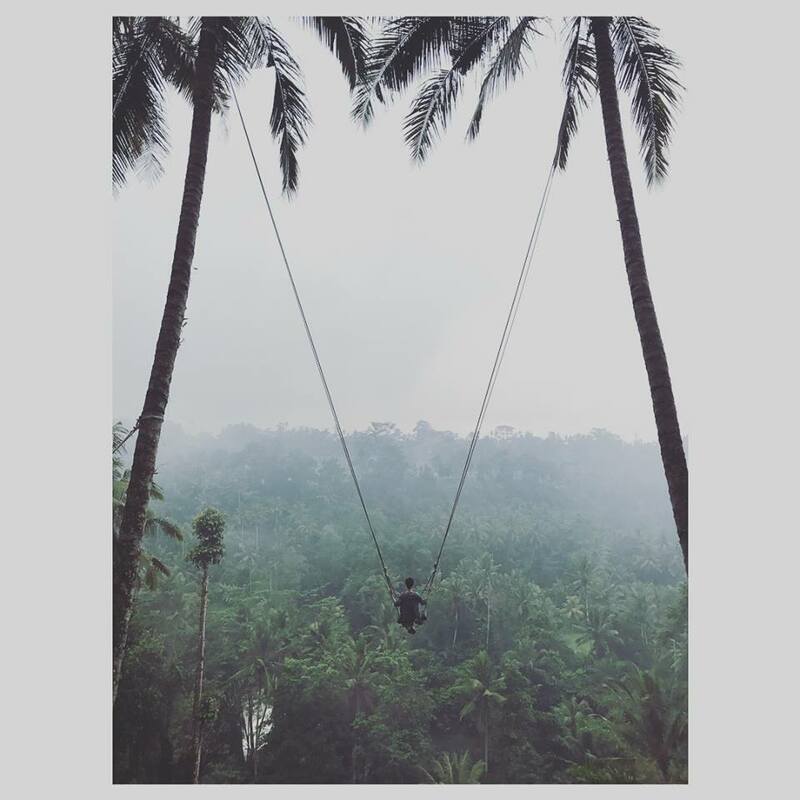 So that’s my Balinese journey in a nutshell- a wealth of adventures, inspiration and memories. But I know that some of you reading this will be wondering about how I actually dealt with certain situations whilst I was away, and as always, I am going to be completely honest about those moments when anorexia tried to grasp onto those tantalizing strings of vulnerability. When I consider those strings, I think it would be fair to say that as soon as I boarded that plane, all of those were within reach, and I think it would be even more fair to say that anorexia had a little go at tugging each one of them. There was one thing that I was so incredibly grateful that I had spent so much time working on during my recovery- food rules. I hinted earlier about the Balinese diet, well, lets just say that I was extremely pleased that I have managed to minimise my fear of carbohydrates- refined carbohydrates in particular. Basically, to put it bluntly, my diet for 4 weeks consisted of toast for breakfast, rice for dinner and noodles for tea. Considering that 2 years ago it was taking hours of therapy for me to accept putting a piece of bread in my mouth, let alone the vast array of obscure behaviours I adopted before it even made its way to my lips; I am sure you will now get an appreciation for how thankful I was of all of the support I received during hospital to abolish those fears and behaviours. To say that my time in Indonesia would have been a catastrophic situation is an absolute understatement. However, I think it is important for me to acknowledge that although I ate the food, most onlookers would not be aware of the tiring tug of war battle going on in my head. Serving size, how it had been prepared, greed, impact on body size and lack of control; they all had a go at trying to make me retract myself from the enjoyable situation I was engaging with. However, I was proud of the resilience I have developed to prevent this from happening, albeit an exhausting fight. Undoubtedly, whilst I was away I embodied the holiday frame of mind. Every day I enjoyed a sweet treat or 2 from one of the local cafes. It became something that I would look forward to at the end of the day, and although guilt rushed through me from all angles- more so from a financial perspective- the strength in my own voice broke through the negativity raging on in the background of my mind. We were fortunate enough to be living in a village with some great cafes, and when you pick up a huge brownie with vanilla ice cream and chocolate fudge sauce for £2.20, there is no surprise that I had about 4 of these during my first week! For me, it was all about remembering that life is for living and if I wanted something chocolaty then I was not going to deny myself that. I was literally having the time of my life with the most amazing company and my issues with food, financial guilt and body image needed to take a backseat to make these wonderful memories. As with every challenge I face, I try to remember that although the issues are niggling away, the fact that I am where I am right now and not in the situation I found myself in 2 years ago is, in my mind, a miracle. When I think back to who I was- and I mean that literally, I was not even me- I cannot believe how different my life is now. Sometimes all I need to do is revisit some of my first blog posts that touch on my destructive behaviours to realise how far I have come. I still wake up every morning and thank everybody that has helped me along the way to reach this point where I am at now, who knows where I would have been if it hadn’t have been for them. I guess the only concluding remark I can leave now is, where to next?